The 2014 Hawaii gubernatorial election took place on November 4, 2014, to elect the Governor of Hawaii, concurrently with a special election to Hawaii's Class III Senate Seat, as well as other elections to the United States Senate in other states and elections to the United States House of Representatives and various state and local elections. Primary elections were held on August 9, 2014. In Hawaii, candidates for Governor and Lieutenant Governor run in separate primaries and are then elected on the same ticket. Incumbent Democratic Governor Neil Abercrombie ran for re-election to a second term in office, but was defeated by State Senator David Ige in the Democratic primary, making Abercrombie the first incumbent Governor to lose renomination in Hawaii history. 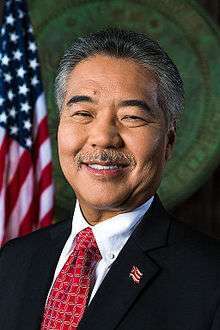 Incumbent Democratic Lieutenant Governor Shan Tsutsui was renominated. The Republicans nominated former Lieutenant Governor Duke Aiona and pastor and former circuit court judge Elwin Ahu. Also running as an Independent was former Mayor of Honolulu Mufi Hannemann and former Honolulu parks and recreation director Les Chang. Ige and Tsutsui won the election. Brian Schatz won the Democratic primary for Lieutenant Governor in 2010 with 37% of the vote and was elected alongside Abercrombie. After the death of U.S. 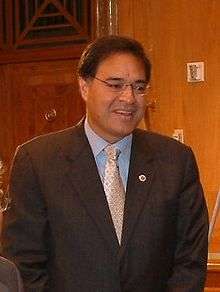 Senator Daniel Inouye in December 2012, Abercrombie appointed Schatz to succeed him in the Senate. Schatz resigned as Lieutenant Governor and was succeeded by Shan Tsutsui, the President of the Hawaii Senate. Hawaii has strict criteria for independent candidates seeking to participate in the general election. Three of the four candidates were disqualified for not having a running mate. The other candidate also had no running mate, but had already withdrawn from the race. They all still appeared on the ballot, alongside a notice about their status. ↑ "Hawaii Gov. Neil Abercrombie says he will seek second term". April 29, 2013. Retrieved May 2, 2013. ↑ "Hawaii Gov. Abercrombie gets a primary challenger". The Washington Post. July 9, 2013. Retrieved July 10, 2013. ↑ "Candidate Q&A — Governor of Hawaii: Van Tanabe". Civil Beat. July 9, 2014. Retrieved August 1, 2014. ↑ "Case To Join Outrigger, Says Political Career Likely Over". Honolulu Civil Beat. July 12, 2013. Retrieved July 16, 2013. ↑ "Rep. Colleen Hanabusa to challenge Sen. Brian Schatz in 2014 primary". Hawaii News Now. April 23, 2013. Retrieved April 23, 2013. ↑ "President endorses Abercrombie for re-election". Honolulu Star-Advertiser. December 20, 2013. Retrieved January 18, 2014. 1 2 3 "IBEW backs Governor Abercrombie for Re-Election". Hawaii News Now. June 7, 2013. Retrieved December 11, 2013. 1 2 Kerr, Keoki (November 18, 2013). "Cayetano drops support for Abercrombie, backs Ige". Hawaii News Now. Retrieved December 11, 2013. 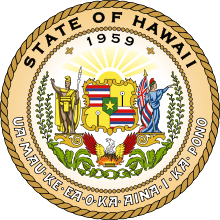 1 2 3 4 5 6 7 8 9 "Primary Election 2014 -State of Hawii – Statewide" (PDF). Hawaii Office of Elections. Retrieved October 24, 2014. ↑ Tran, Cam (December 27, 2012). "Tsutsui's promotion causes ripple effect: Senate to vote on new president on opening day". KITV. ↑ "Hee Candidacy Shakes Up Gov and Lt. Gov Races, and Hawaii Senate". Honolulu Civil Beat. May 11, 2014. Retrieved May 13, 2014. ↑ "Lt. Governor Shan Tsutsui Will Run in 2014". Hawaii Reporter. May 31, 2013. Retrieved May 13, 2014. 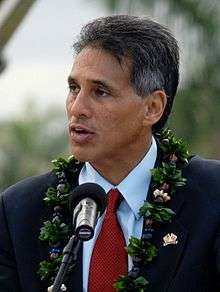 ↑ "Republican Duke Aiona officially enters Hawaii race for governor; race has echoes of 2010". The Republic. May 19, 2014. Retrieved May 20, 2014. ↑ Ian Scheuring (March 21, 2014). "State GOP chair confirms Djou congressional run". Hawaii News Now. ↑ Derrick DePledge (January 17, 2014). "`In discussions ...'". Governing. Retrieved January 27, 2014. ↑ "Boxer Manny Pacquiao endorses Duke Aiona for governor". KITV4. October 14, 2014. Retrieved October 26, 2014. ↑ "Pastor to seek Republican nomination for lieutenant gov". Honolulu Star Advertiser. February 27, 2014. Retrieved May 13, 2014. 1 2 DePledge, Derrick (June 3, 2014). "Hannemann picks ex-parks chief as gubernatorial running mate". Honolulu Star-Advertiser. Retrieved June 30, 2014. ↑ "Pastor seeks GOP nomination for lieutenant governor". Find Law. Retrieved May 13, 2014. ↑ "Jeff 'The Solar Guy' Davis Running for Hawaii Governor". January 9, 2014. Retrieved February 8, 2014. ↑ "Mufi Hannemann announces candidacy for Hawaii governor's race". Hawaii News Now. April 25, 2014. Retrieved April 25, 2014. ↑ "No Independent Candidate Polls Enough Votes in Hawaii Primary to Advance to General Election Ballot". Ballot Access News. August 10, 2014. Retrieved October 27, 2014. 1 2 3 4 5 "Nonpartisans in Hawaii governor race disqualified". West Hawaii Today. June 25, 2014. Retrieved October 27, 2014. ↑ "Hawaii General Election 2014" (PDF). Hawaii Office of Elections. 2014-11-04. Retrieved 2014-12-18. "Jeff Davis for Governor". Archived from the original on 2014-02-27.